VANCOUVER – The Canadian forest products industry is well positioned for a bright future after making robust advances in labour productivity even while facing one of its worse downturns in history. A Detailed Analysis of Productivity Trends in the Canadian Forest Products Sector was undertaken by the Centre for the Study of Living Standards (CSLS) for the Forest Products Association of Canada (FPAC). The independent study shows that between 2000 and 2012 the labour productivity of the Canadian forest products industry grew at a compound annual rate of 2.5%, well above the overall Canadian business sector growth of 0.7%. For Canada’s forest industry, improving productivity — even during the downturn in U.S. housing construction and 2009 recession — was as much a matter of survival as it was good business, new research commissioned by the Forest Products Association of Canada shows. Productivity gains in the industry outstripped the Canadian average from 2000 through 2012, even among lumber producers (particularly British Columbia’s) during the recession, according to an analysis done by the Centre for the Study of Living Standards on behalf of FPAC. Crews returned to work at local Western Forest Products mills Monday following temporary shutdowns in the wake of last week’s deadly shooting at a sister mill in Nanaimo. WFP’s three manufacturing mills in Chemainus, two in Ladysmith and and one in Cowichan Bay all were closed immediately following the Nanaimo incident which saw two men killed and two more taken to hospital Wednesday, April 30. However Ladysmith Sawmill, Saltair Sawmill, Chemainus Sawmill, Cowichan Bay Sawmill Value Added Reman and South Island Reman all re-opened as of yesterday after being closed for two working days at the end of last week. Despite the recovery of the North American housing market, B.C. lumber producers had a rough start to the year, as weather and the Vancouver truckers’ strike led to disruptions that are now showing up in first quarter results. Of the five Western Canadian companies that have released their results, revenues are down 2.2% from the first quarter of 2013, PricewaterhouseCoopers vice-president Jason Boyer told the consulting firm’s annual global forestry conference May 6. “The first quarter certainly was challenging for lumber,” he told delegates at the daylong Vancouver conference. VANCOUVER – International Forest Products Ltd. says a big income tax recovery help to sharply boost net income in the first quarter. The Vancouver-based lumber producer says net earnings were $27.5 million or 43 cents per share in the three months ended March 31. That was up from $15.2 million or 27 cents in the prior-year period, courtesy of a $16.6 million deferred income tax recovery. Sales revenue rose to $294.8 million from $242.5 million. NANAIMO — As Western Forest Products workers returned to the mill where four people were shot last week — in some cases in front of them — the company and its union said they’re working to review security policies. …On Tuesday, a police officer and two security guards screened all vehicles going in and out of the mill. Nearby, a flag was at half-mast, and nearly 20 red T-shirts hung on a fence, part of a growing memorial that included more than 100 bouquets. Inside, workers met with counsellors, walked around the site and talked to one another. Catalyst Paper recorded adjusted earnings before interest, taxes, depreciation and amortization (EBITDA) of $25.7 million compared to $19.1 million in 4Q 2013. Results reflect predominantly a weaker Canadian dollar, as well as higher pulp prices and improved production. Production volumes were more than 2% higher than the prior year average, as the company said in the press release received by Lesprom Network. Stephen Boon calls Resolute Forest Product’s decision to permanently close its Fort Frances pulp and paper mill a “final major blow” to the community. Boon, Unifor’s national representative in Dryden, said workers have done everything they can to help the company work through financial difficulties, including agreeing to wage, benefit and pension cuts, but it wasn’t enough. “We all hoped these difficult employee sacrifices, the abundance of quality wood fibre and necessary capital investment to reposition the Fort Frances site specifically related to the kraft mill,” Boon said. Over 750 contracted workers, most from over 30 companies that operate in New Brunswick, are on the job at Irving Pulp & Paper and Irving Tissue in west Saint John, Canada.These workers are in addition to the team of 340 people that work at the Irving Pulp & Paper mill.Before the $450 million modernization project gets into full gear the company is completing its regularly scheduled maintenance shut which occurs every 18 months.The $13.5 million project involves upgrades to virtually every area of the mill but the big jobs include boiler inspection and repairs; the startup of new washing equipment and a new control system, as the company said in the press release received by Lesprom Network. Bad news from Abitibi executives is nothing new for mill workers. So, yesterday’s announcement from Fort Frances wasn’t a complete surprise. Company executive Xavier Van Chau talks about their decision to close. “We spent the last number of months looking for opportunities to reposition the mill, particularly the pulp assets, particularly at Ft. Frances. …”Over the last little while, we’ve made investments in our Atikokan sawmill, in the restart of our idled Ignace sawmill, as well as the expansion of our Thunder Bay sawmill. Together, all three of those projects combined is worth about $90 million of investment and create about 200 jobs,” he said. In the House of Assembly Tuesday, Northern Peninsula MHA Christopher Mitchelmore wanted to know what the government is doing to get the wood pellet plant in his district working. Despite the government pouring $10 million in funding into the Roddickton plant, it has never commercially produced wood pellets. “Are you committed to ensuring the forestry resources on the Great Northern Peninsula mean local jobs and value-added products, or are you content with another white elephant?” Mitchelmore asked in the House. The Brazilian Tree Industry (IBA or Indústria Brasileira de Árvores) is the newest association in the Brazilian forestry sector and is the result of a merger of three major associations; ABRAF (Brazilian Association of Forest Plantation Producers), BRACELPA (Brazilian Pulp and Paper Association) and ABIPA (Brazilian Association of Wood Panel Industry), as ITTO reported. The term IBA, or more correctly Ibá, comes from the Tupi Guarani language Ybá, which means tree or fruit. The new association will be formally launched in June 2014, during the environment week and will begin with a membership of 70 forestry sector companies. DIRTT Environmental Solutions has built a prototype timber frame mezzanine, which it says significantly increases the amount of usable office space in high-ceiling buildings such as warehouses and factories. …The centuries-old post and beam wood design, combined with the design and manufacturing precision delivered by DIRTT’s proprietary ICE software, lets clients create engaging, unique workspaces combining the warmth of wood with integrated technology, writeable surfaces and other 21st century amenities. The northern boreal forest stretching from this province all the way to the Yukon is one of the largest intact forests left on Earth and a new report is pushing for the preservation of 50 per cent of it. “Boreal Birds Need Half” is a report by the Boreal Songbird Initiative and Ducks Unlimited. Jeff Wells is the science and policy director of the former group and says there are an estimated one billion to three billion birds nesting in that vast expanse of forest. The birds coming and going from the boreal forest in the spring and fall use the explosion of resources in the forest during the summer months to breed successfully before migrating south again. PRINCE GEORGE – The Wildfire Management Branch has responded to seven new wildfires in the Prince George Fire Centre over the past 24 hours. It’s suspected that all of these fires were caused by people. Prince George Fire Centre crews helped several local fire departments deal with escaped yard fires and also responded to multiple wildfires resulting from poorly planned or inadequately monitored open burns. Grassfire hazards are present in many areas of the Prince George Fire Centre and members of the public are reminded to be extremely cautious when using fire to clean up their properties. Experts are expecting hot and dry conditions for the Alberni Valley at the height of the area’s forest fire season. As crews prepare for blazes that could arise over the upcoming months, the forecast was made by weather technicians working with the province’s Wildfire Management Branch. “This year, we’re being told that we are going to have a hot and dry later summer and into the fall,” said Marg Drysdale, a fire information officer at the province’s Coastal Fire Centre in Parksville. The Thunderbirds are the Island’s unit attack crew, based out of the Alberni Valley Regional Airport northwest of Port Alberni. VANCOUVER – Western Forest Products Inc. says its first-quarter net income amounted to $23.6 million, or six cents per share, compared to $22.8 million, or a nickel a share, in the same period last year. The Vancouver-based company says lumber revenues improved by 11 per cent over the first quarter of 2013, supported by higher prices and a favourable exchange rate. The $23.6 million in net income was drawn from $246 million in sales _ up from $233.8 million in sales recorded in the same period a year ago. The Alward government is being criticized for its decision to use tax dollars to pay for newspaper ads that promote its new Crown forestry plan, roughly four months before a provincial election. 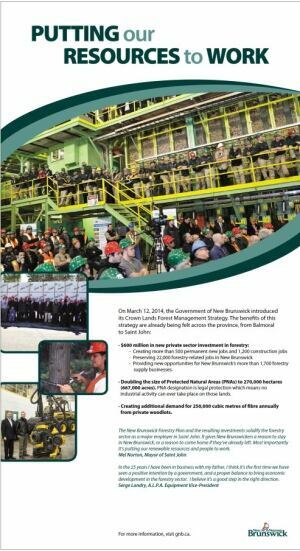 The full-page colour advertisements, which include photos of workers at a press conference along with cabinet ministers, such as Paul Robichaud and Bruce Fitch, have been printed in provincial newspapers this week. Kevin Lacey, the Atlantic director of the Canadian Taxpayers Federation, called the ads “a waste.” “It should really anger a lot of taxpayers to see this money going out the door on things that really the government should be doing on its own,” Lacey said. 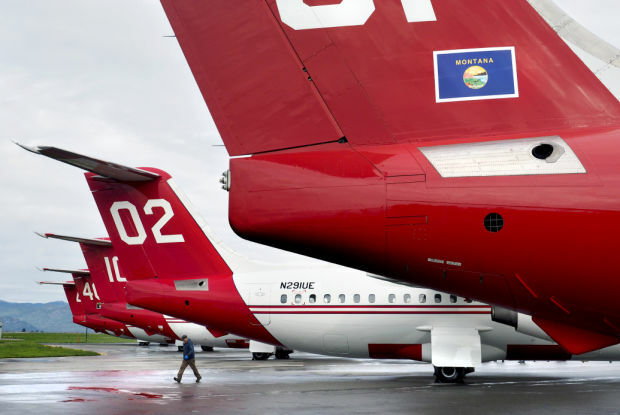 Red-flag weather warnings are already up for parts of Texas, Colorado, New Mexico, Arizona, Oklahoma and Kansas this spring, but firefighters still don’t know how many large air tankers might be available for retardant drops. In Missoula, Neptune Aviation rolled out its five new BAe-146 jet tankers Tuesday for a photo shoot. But it only has a definite U.S. Forest Service contract for one of those, and hasn’t heard how a protest might be resolved regarding the others. Some public lands with beetle kill in Summit County soon could be fast-tracked for U.S. Forest Service treatment under a new rule. The federal agency would use the rule to designate land affected by insect and disease epidemics all over the country for expedited review, which would mean less environmental analysis and more required community collaboration. “Folks have been asking for a long time how can we get this work done faster without undermining some of the environmental safeguards,” said Noah Koerper, Central Mountains regional director for U.S. Sen. Michael Bennet. Dan Galecki has spent his entire working life in the woods. From the University of Wisconsin, where he got his degree in forestry in 1987, to Alaska, Colorado, Oregon and Washington, he’s worked for a wide variety of clients in all kinds of forest landscapes. Now, as the proprietor of Spindrift Forestry Consulting in Bend, he’s working on the urban landscape of the City of Sisters. Galecki has been hired as a contract consultant and will be tasked with consulting the City on actions involving trees (including but not limited to removal). He is currently helping the City develop an Urban Forest Management Plan. At first glance, C.B. Thomas (guest opinion, April 27) offers an interesting case on the relationship between timber production and revenues for O&C counties. But the historic connection between counties and timber revenues from nearby public forests isn’t unique to Western Oregon. When resources are sustainably managed to meet demand, government agencies have proved themselves capable of consistently generating revenues for public education, law enforcement, roads and other essential services. The standing-room-only crowd at the Museum of Northern Arizona last week to discuss the Four Forest Restoration Initiative (4FRI) was both urgent and enthusiastic. The urgency is warranted – 4FRI has been sluggish. The enthusiasm is perhaps less expected at this stage but a good sign for the initiative. 4FRI is a massive undertaking, a collaboration of the U.S. Forest Service and 30 groups of stakeholders to thin and ecologically restore Coconino, Apache-Sitgreaves, Tonto and Kaibab national forests at a landscape scale to protect against forest fires. Balancing forest protection and economic growth not only requires political leadership but strong leadership from the corporate sector. That is why Greenpeace and hundreds of thousands of people in Indonesia and around the world who support forest protection are pushing companies to clean up their supply chains. When the companies show they want to change and remove forest destruction from their supply chains, we sit down with them and review their policies. Just last week, Johnson & Johnson committed to No Deforestation, following on the heels of other consumer goods giants like Procter & Gamble. Europe has high hopes of obtaining much of its energy from sustainable sources, and to meet its goals, it has made some dubious choices. Biomass—the fancy word for burning wood—is one such example. This supposedly renewable resource may not be so green. The argument for biomass’s green credentials is fairly straightforward. If you plant a tree for each one you cut down, in the long term, the carbon dioxide taken out of the air by these new trees should counteract what’s emitted by burning the old trees. The Obama Administration’s release of the third U.S. National Climate Assessment tells what Idahoans already know: winters are getting warmer, the runoff is coming sooner and we are seeing increased wildfires because of our increasingly hot, dry summers. The report, written by many of the nation’s top climate scientists and peer reviewed by many more, shows how climate change already has affected both the built and natural landscape. And it predicts even changes more over the next 50 years. European countries will increase imports of solid biofuels to 50-80 million tons by 2020, as according to the REScoop 20-20-20 project it is expected to increase energy production from renewable sources to 20% in the European Union. The project will be implemented, generally, due to modernization of number of existing power generation facilities and through conversion of power plants from coal to solid biofuels. The goal will be reached through construction of new power plants run on biomass as well. Thus, Britain, Denmark and Italy are the main consumers on the European pellet market.